Why did humans abandon hunting and gathering for sedentary communities dependent on livestock and cereal grains, and governed by precursors of today's states? Most people believe that plant and animal domestication allowed humans, finally, to settle down and form agricultural villages, towns, and states, which made possible civilization, law, public order, and a presumably secure way of living. But archaeological and historical evidence challenges this narrative. The first agrarian states, says James C. Scott, were born of accumulations of domestications: first fire, then plants, livestock, subjects of the state, captives, and finally women in the patriarchal family-all of which can be viewed as a way of gaining control over reproduction. Illustrations note 13 b-w illus. "[Scott's work] has focussed on a skeptical, peasant's-eye view of state formation. . . . His best-known book, Seeing Like a State, has become a touchstone for political scientists, and amounts to a blistering critique of central planning and `high modernism.' . . . Scott's new book extends these ideas into the deep past, and draws on existing research to argue that ours is not a story of linear progress, that the time line is much more complicated, and that the causal sequences of the standard version are wrong. "-John Lanchester, New Yorker "Against the Grain delivers not only a darker story but also a broad understanding of the forces that shaped the formation of states and why they collapsed - right up to the industrial age . . . an excellent book. "-Ben Collyer, New Scientist "Scott offers an alternative to the conventional narrative that is altogether more fascinating, not least in the way it omits any self-congratulation about human achievement. His account of the deep past doesn't purport to be definitive, but it is surely more accurate than the one we are used to. "-Steven Mithen, London Review of Books "Forget the Paleo Diet: Scott goes all the way in showing how early nomadic peoples in the Fertile Crescent were fitter, happier and more productive than the semi-enslaved ziggurat-builders of the ancient Mesopotamian cities. "-James Whipple (M.E.S.H), Frieze "This is an important book, which should be read by every educated person. The story it tells is so different, so opposed, to the received narrative it deserves to be everywhere known. Scott's presentation of evidence is so complete that the received narrative simply can no longer stand. Additionally, Scott writes extremely well: a clear, unambiguous, approachable style, with occasional sparkles of gentle humour to ease the way. The book is an intellectual delight. "-George Gale, Metascience "Scott's original book is history as it should be written" - Barry Cunliffe, Guardian "History as it should be written-an analysis of the deep forces exposed to the eternal conflict between humans and their environment. What makes it even more welcome is that it has been written with the enthusiasm of discovery. "-Barry Cunliffe, Guardian "Written with great enthusiasm and characteristic flair . . . Scott hits the nail squarely on the head by exposing the staggering price our ancestors paid for civilisation and political order. "-Walter Scheidel, Financial Times An Economist Best History Book 2017 "Fascinating. "-George Monbiot, Guardian "Against the Grain delivers what is says on the tin and is a fine piece of historical counter-narrative, with elements of environmental history woven throughout. . .This results in a book that is fascinating, readable, but above all thought-provoking. It certainly made me ponder the "civil" part in civilization." -Leon Vlieger, Natural History Book Service "The value of the book. . . is precisely in the sorts of provocative questions it raises and the debates it will spark. Scott brings archaeology into one of the most important insights of his wider project, that states are neither inevitable nor neutral. In doing so, he has created a space in which archaeology becomes relevant for current political concerns, and for this reason alone his book should be widely read. "-Antiquity Finalist for the 2018 CT Book Award "A sweeping and provocative look at the 'rise of civilization,' focusing particularly on those parts, peoples, and issues that are normally overlooked in conventional historical narratives. "-Alison Betts, The University of Sydney "This book is fascinating and original, containing a lesson on every page. Brilliant. James Scott is a legend. 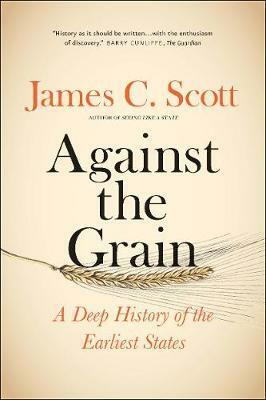 "-Tim Harford, author of Messy and The Undercover Economist "Scott is at his most intellectually omnivorous in Against the Grain, drawing on a vast array of sources to upend our basic assumptions about state formation and civilization. "-Edward D. Melillo, author of Strangers on Familiar Soil: Rediscovering the Chile-California Connection "Against the Grain is not just a "counternarrative," an outsider's skeptical reaction to received wisdom about the evolution of agricultural systems and the first states in Mesopotamia. Vainglorious kings with their generals and armies, sycophantic scribes, and royal architects and engineers are not Scott's heroes. His concerns are with urban laborers, peasants, and barbarians and the cleavage planes of resistance to rulers. Those studying Mesopotamia-and other early states-take heed. "-Norman Yoffee, editor of Early Cities in Comparative Perspective "A contemporary master of the political counter-narrative has produced a book on the origins of civilization - this is, quite simply, a must-read. "-David Wengrow, author of What Makes Civilization?